John Guest, Mur-lok & Jaco tube tees. We freely mix Mur-lok and John Guest fittings on the products we build. Small parts like o-rings and collets interchange between the two styles. The most commonly used fittings on reverse osmosis units are the nylon compression fittings called Jaco and the more recently developed push-in quick connects called John Guest. 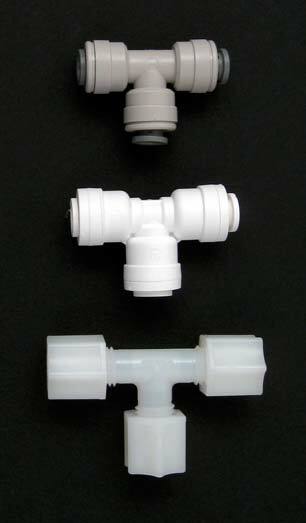 There are many manufacturers of both styles, but the imitators are most often referred to by the name of the originator — the way that all soft drinks are sometimes called “cokes.” The fittings on our page are from the original manufacturers — John Guest and Jaco — and we also supply the superb double-o-ring Mur-lok Fittings from the G. A. Murdock Company. The two fittings styles can be interchanged without a problem. If your unit uses Jaco fittings and you want to replace one or more fittings with a John Guest style, there's no problem. There is, however, one essential rule you must follow: Jaco fittings must always be used with a tube insert, and tube inserts are never used with John Guest or Mur-lok quick connects. To connect Jaco Fittings, back the nut onto the tube, insert the tube insert as far as it will go into the tube, then screw on the nut. Tighten it as tight as you can get it with your hand, then take one more complete turn with a wrench. No more than one. Over tightening will eventually result in a leak. With John Guest style, be sure that the tube is cut squarely, then push it into the fitting until you feel it hit bottom. It's done. If you need to remove the tube, be sure that all pressure is off the fitting, push in on the collet with your thumbnail, and pull the tube out. The tubing we sell and the tubing we use on all units that we build is top grade polyethylene from John Guest or G. A. Murdock. Tubing used for reverse osmosis units is always measured by its outside diameter. Undersink reverse osmosis units use 1/4" OD tubing, and some units use a mixture of 1/4" and 3/8" tubing. Remember: Always use a tube support with Jaco fittings, but never use a tube support with quick connect fittings. See our complete catalog of quick connect fittings.